Today we have prepared 10 DIY white clay masks recipes which are included in our ultimate list of 80 DIY clay masks with 8 clay types. Check out the main article to find out about other types of clay and masks with them. White clay is a unique and at the same time a traditional raw material for the manufacture of a variety of cosmetic products. Its natural purity, whiteness, the absence of abrasive particles in the composition make kaolin a valuable component in cosmetology. No wonder it is so actively used to treat skin diseases in the form of ointments, powders, pastes. 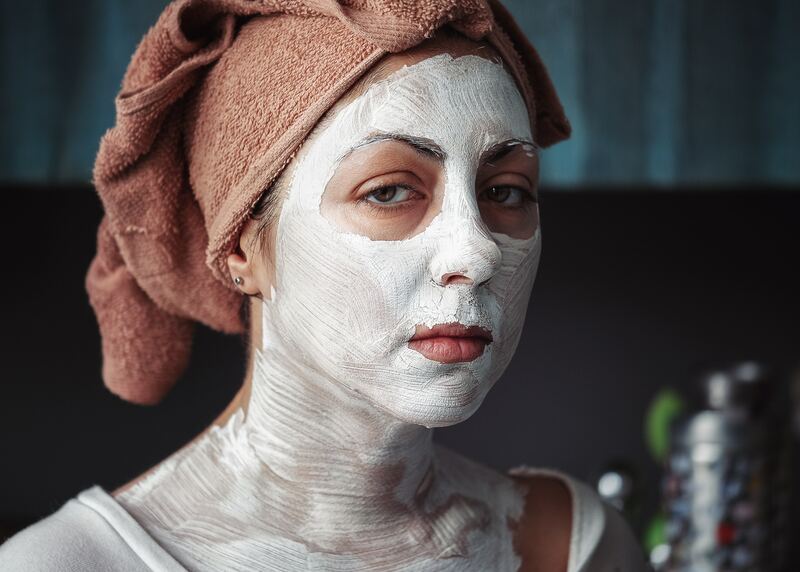 Make white clay an essential component in your homemade masks: for treating acne, reducing oily shine, for antiseptic and regenerating effects, for nourishing the skin with minerals, absorbing toxins and easing cells regeneration. These advantages and also its affordable price, make white clay an indispensable component in DIY face masks. In order to make a white clay (or kaolin) cosmetic mask at home, you do not need to reinvent the wheel and to experiment. There is a mass of ready-to-use recipes, in which other components are matched to kaolin, harmoniously combined with it within the framework of cosmetic effects on the skin. They contain recommended dosages and proportions. With these recipes at hand it is quite easy to prepare exactly the mask that will have the desired effect on your skin and will not disappoint with the results. Dilute white clay with warm water (herbal decoction or milk) to the desired consistency. Clay powder is usually diluted with a liquid in a ratio of 1 to 2. Stir the mass so that there are no lumps. The resulting creamy mixture is applied on the face with a thick layer. Try not to affect the area around the eyes. If the mask dries out fast use a floral or thermal water spray as the clay layer should be slightly wet all the time. After about 15 minutes wash off the mask with lukewarm water. After the clay mask it is necessary to apply a nourishing cream. Prepare a couple of tablespoons of porridge (oatmeal with milk), cool it down to room temperature, add 1 tbsp. of white clay powder, previously diluted with 3-4 tbsp. of milk. Evenly distribute the mix on the face and hold for 15 minutes, then wash with lukewarm water while gently massaging the skin. The procedure makes the epidermis smoother, removes impurities and eliminates peeling. Dilute kaolin (2 tablespoons) with aloe vera juice, previously kept in the refrigerator for 3 to 14 days (1 tablespoon), and mineral non-carbonated water (1 teaspoon). Tea tree oil is famous for its powerful anti-bacterial, antifungal, antiseptic and anti-inflammatory properties. 1 tbsp. of kaolin to be diluted with water and 3 drops of tea tree oil are to be added to the resulting paste. The mask is applied to the entire face and kept for up to 20 minutes. You can add more tea tree oil, 7-10 drops, and then apply the composition in a patchy way, only on the pimples themselves. Dilute white clay powder (2 tablespoons) with fresh cucumber juice (1 tablespoon). Apply a thick layer on the face, wait for 10-15 minutes and wash off with lukewarm water. Spray on some thermal or floral water and apply a nourishing or moisturizing cream after 20 minutes. Dilute 1 tablespoon of white clay with 2 tablespoons of warm milk of average fat content, add 1 teaspoon of pre-warmed honey. Mix kaolin with cottage cheese and thick sour cream (1 tablespoon each), dilute with warm milk until desired consistency. Make a composition of dried herbs: linden, lavender, chamomile, sage. Chop them in order to get 1 teaspoon of dry powder for each of these herbs. Stir them, pour a glass of boiling water, keep it covered for half an hour, then strain. Dilute white clay with this herbal elixir to the desired consistency. Dilute white clay (2 tablespoons) with warm water until the desired consistency is achieved. After mixing, immediately before applying to the face add 1 tablespoon of unrefined olive oil.